From the heartland of Ireland’s midlands, JigJam’s style blends the best of traditional Irish music with bluegrass and Americana in a style they call “CeltGrass.” Their onstage energy, along with superb musical ability, has captivated audiences in Ireland, the United Kingdom, Europe and North America including Milwaukee Irish Fest. 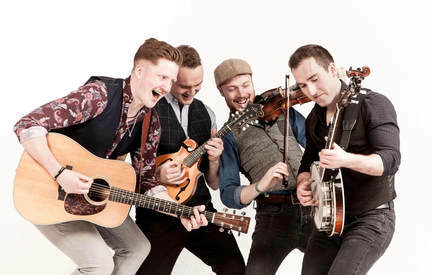 Band members Jamie, Cathal and Daithi from Tullamore, County Offaly, and Gavin from County Tipperary grew up immersed in Irish traditional music and culture. Collectively, they achieved more than 20 All-Ireland titles at Fleadh Ceoil na hÉireann competitions. Although their unique style is influenced by American folk music, they remain close to their Irish roots. All multi-instrumentalists, they interchange between banjo, guitar, mandolin and double bass during their shows. Dressed sharply in ties, jackets and vests, their energy-fueled, foot stomping live performances have been compared to the Punch Brothers by the European Bluegrass Music Association. JigJam has released two studio produced albums, Oh Boy and Hello World as well as Live in Tullamore, which came out in 2017.